Horse drawn carriages were one of the most common means of transport in the Victorian period. Thousands of people travelled on the roads eveyday in a variety of diferent vehicles. The wealthy had private carriages that were often large and comfortable but there were also Hackney cabs and Hansom Cabs that could be flagged down on the streets and would carry customers right to their homes. In addition trade vehicles used the roads; many businesses like bakers, butchers, fishmongers and drapers stores used carts to deliver produce to their customers. 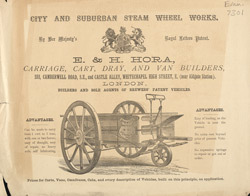 A cart builder like E. H. Hora would have been a highly skilled craftsman, much in demand.